The Fountain Creek Watershed is located along the central front range of Colorado. It is a 927-square mile watershed that drains south into the Arkansas River at Pueblo. The watershed is bordered by the Palmer Divide to the north, Pikes Peak to the west, and a minor divide 20 miles east of Colorado Springs. 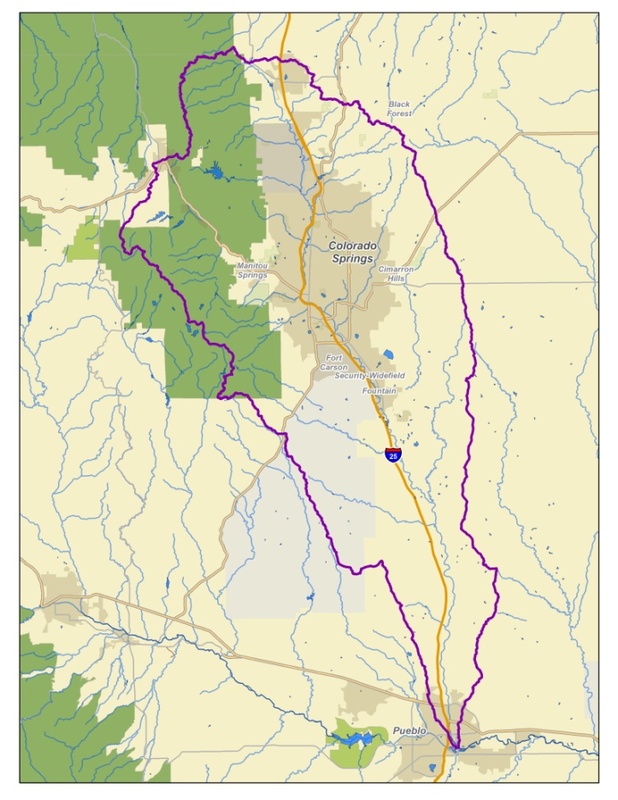 Map via the Fountain Creek Watershed Flood Control and Greenway District. Bennet’s amendment would provide as much as $9 million to reimburse water utilities in Security, Widefield and Fountain for what they laid out in 2016 after learning their drinking water contained unsafe levels of perfluorinated chemicals from toxic firefighting foam released by Peterson Air Force Base. Security Water and Sanitation District would get up to $6 million to pay for a pipeline it installed to pump clean Pueblo Reservoir water to its more than 19,000 customers. “That’s something we have been working for and hoping for,” said district General Manager Roy Heald. Southern El Paso County water districts began piling up bills in May 2016 after tests of water from the aquifer revealed contamination levels up to 30 times more than the maximum recommended by the U.S. Environmental Protection Agency. Districts’ officials assumed the Air Force would pay to fight the contamination and were shocked when the military refused to pay the bill. The Pentagon concluded it couldn’t reimburse the districts without authorization from Congress. That’s where Bennet’s amendment comes in. The brief measure piggybacks on a similar move to reimburse towns where water contamination came from National Guard bases and expands it to include active-duty posts including Peterson. Bennet got support from Colorado Republican U.S. Sen. Cory Gardner, who signed on as a co-sponsor. Heald said the senators have worked for months to figure out a fix for the utilities’ financial woes. “They have both been here to talk to us directly about these issues,” he said. But Heald isn’t counting the federal cash just yet. The provision for the money is a tiny part of the massive National Defense Authorization Act, a bill that sets spending across the military and includes hundreds of policy tweaks and changes. With $716 billion at stake, lawmakers are expected to fight for weeks over every word the bill contains. Bennet will need Senate approval, which seems likely with bipartisan support. But then he will have to fight with House lawmakers who signed off on their version of the defense bill, which doesn’t contain the water money. I am writing in regard to the lawsuit the Environmental Protection Agency (EPA) and Colorado Public Department of Public Health an Environment (CDPHE) have filed against the City of Colorado Springs, Colorado. The lawsuit was filed on November 9, 2016, pursuant to Sections 309(b) and (d) of the Federal Water Pollution Control Act and the Colorado Water Quality Control Act. The City of Colorado Springs’ failure to control stormwater has led to decades of discharge that is not in compliance with state and federal clean water laws. 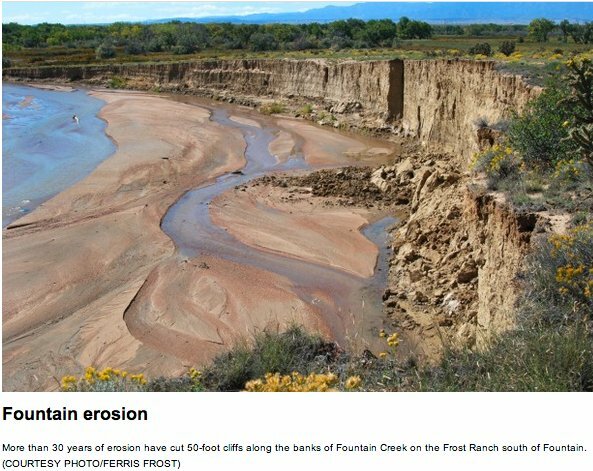 The stormwater has led to sediment buildup in Fountain Creek and created significant problems for downstream communities, especially for Pueblo, Colorado, which is in my Congressional District. Recent reports that the EPA may re-enter negotiations with the City of Colorado Springs raise questions about the future of the lawsuit and the ability of the EPA to provide long-term certainty to downstream communities that their upstream neighbors are complying with clean water laws. The long history of stormwater negotiations between Colorado Springs and downstream water users has not yielded positive, lasting results for communities like Pueblo. While I have been encouraged by the commitment demonstrated by Colorado Springs Mayor John Suthers to solve the long-standing problem, the lawsuit was filed by both the EPA and the CDPHE for a reason. It is imperative that the EPA work to permanently protect the water quality for communities downstream from Colorado Springs. If you have any questions or wish to discuss this issue further, please do not hesitate to contact me. Colorado Springs Mayor John Suthers has said he’d rather spend money on stormwater projects than litigation, but the city’s failure to fix its drainage system over the years has instilled distrust in downstream communities. Voters approved a stormwater fee last fall that kicks in on July 1 but litigants in the lawsuit question if the $17 million a year for 20 years will be adequate to reduce flooding and mitigate sediment in Fountain Creek.